Most likely a coin from Antiochos Hierax (246-227 B.C.). Ob: diademed head of Antiochus I, r., with wing above ear. Rx: Naked Apollo seated l. on omphalos stone (center of the world), holding arrow and resting on bow, Greek word on both sides. The grazing horse below indicates a mint in Alexander Troas (area of ancient Troy). Weight is ~ 6.5 gm, and therefore does not conform to weight standards for a tetradrachm or a drachm (~21mm). Opinion of one expert is that certain design features do not conform to an authentic piece. While it's a nice execution you would have to say its a fake. 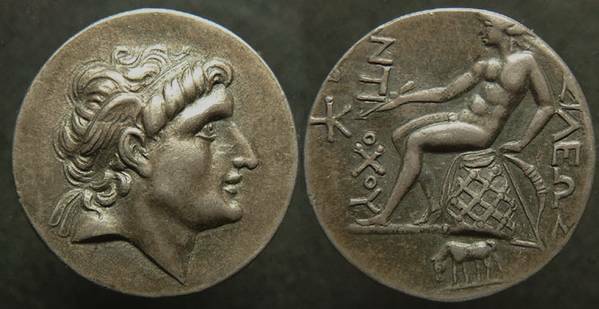 An excellent article that features a story about the discovery of the only known living portrait coin that shows the image of lifetime portrait of Alexander the Great (not Herakles)is linked below. It's a MUST read!